This is an essential text for those who are working at degree level in Biblical Studies as it provides a standard core English text of the Bible. 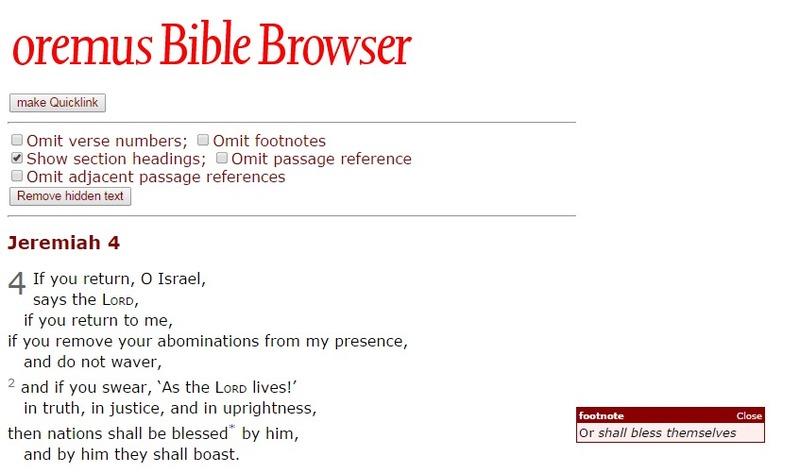 Unfortunately because of copyright restrictions most open-access bible study tools (like those posted here) are not able to include the NRSV text. However, an online edition of this text can be found at Oremus. Texts can be retrieved by typing in ‘book’, ‘chapter’ (and ‘verse’ – optional). Functions include options for the way the text is displayed, displaying multiple passages and a word search. Asterisks placed alongside words (make sure this option is checked on initial search request) denotes the presence of a footnote. Hovering the cursor over the asterisk will open the footnote in the right-hand column. This is an incredible tool that has been designed by Tyndale House, Cambridge and is completely free of charge. 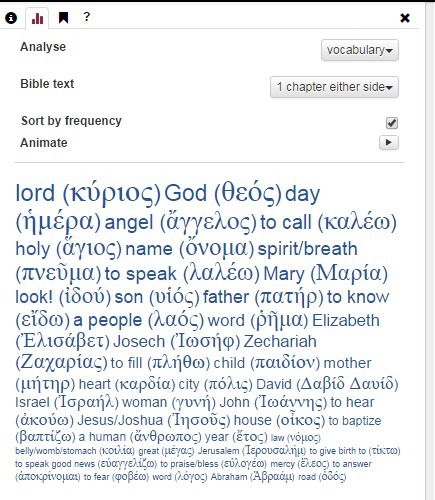 It offers multiple Bibles (including original languages) and sophisticated and flexible search functions that cater for English, Hebrew and Greek word searches. It also includes lexicons and commentaries. The text of each of the Bibles is tagged. Running cursor over words reveals the wording of the original text plus dictionary definitions and statistics (appearing in a pop-up lower pane). By placing in the search box the English option before the Greek the English text would lead. 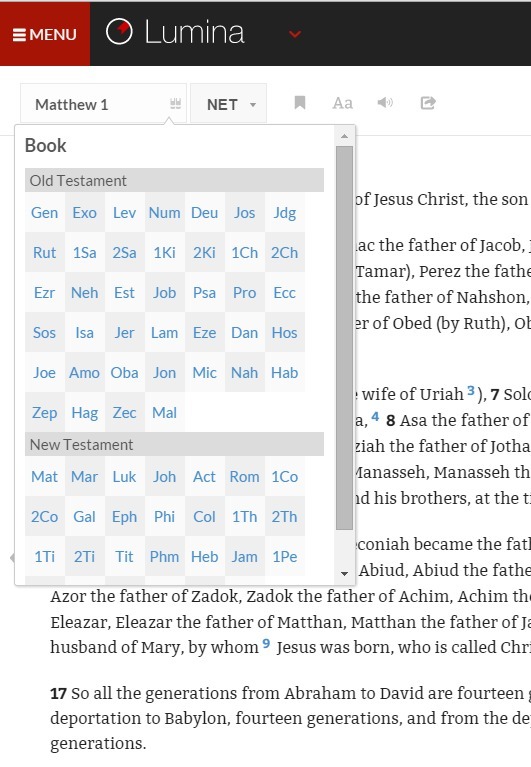 For those who may be a little concerned about using the original language features, Tim Bulkeley (Australian College of Ministries and Asia Pacific Theological Seminary) has produced this short video presentation on using the STEP Bible to find a Hebrew word without knowing Hebrew. 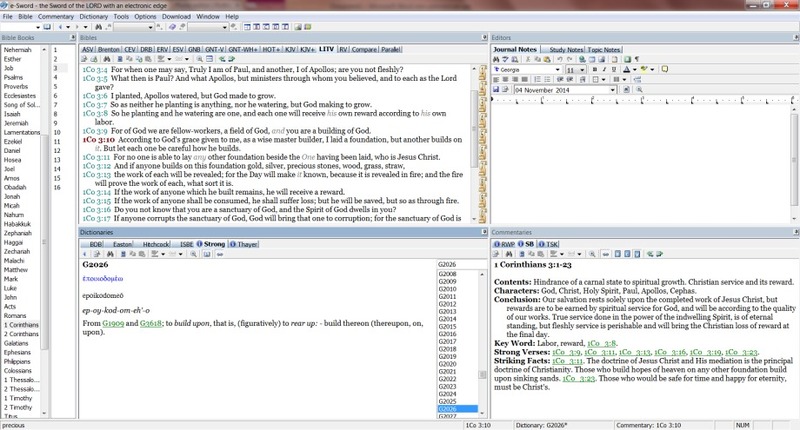 A statistical analysis of the vocabulary found in each verse (by book and Testament) can be revealed by placing cursor over the appropriate verse number. More detailed information about specific words can be revealed by clicking on the highlighted text. This brings up searchable statistical and linguistic information as well as a list of related words. Produced by the Biblical Studies Foundation this is a multiplatform and attractive Bible study tool that is especially suited to beginners. Selecting books (and then chapter) is made through a drop down menu that is revealed by clicking on the book title (default is Matthew 1). Choices of Bibles can be made from the neighbouring button (marked NET). 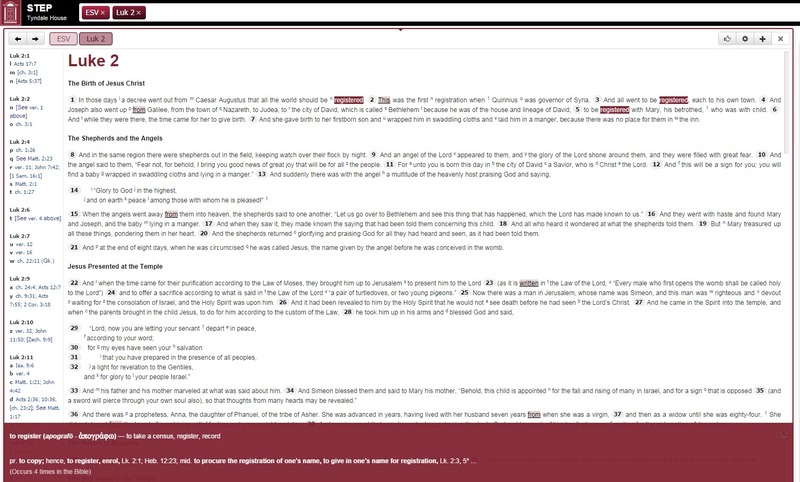 Lumina features seven English language Bibles (including NET, KJV and NASB) each one being tagged to the original language. Helpful notes (linked to the Bibles) provide important explanatory textual information. There is also an index of biblical names and a section for maps. 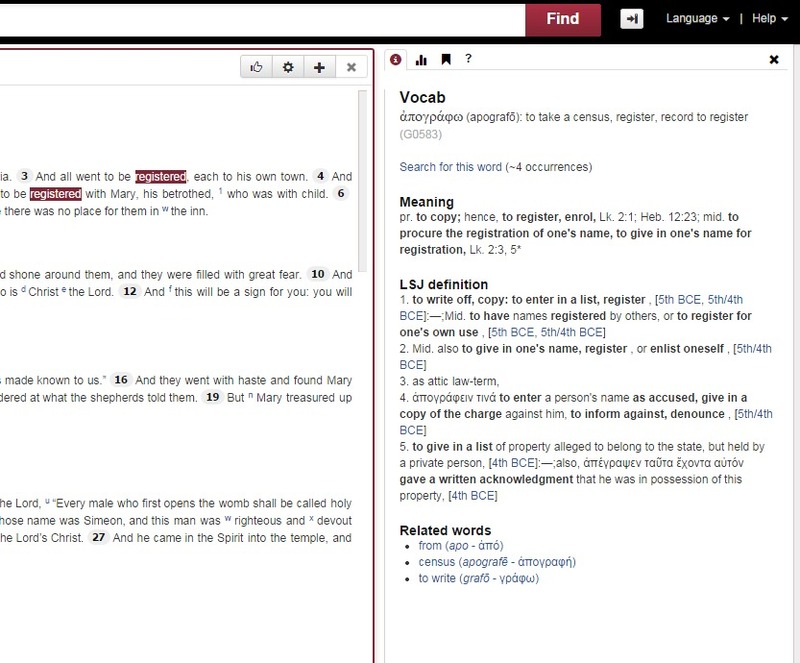 Lumina offers both Hebrew and Greek texts, both of which are fully linked with supporting lexical information. Lumina also has an archive of commentary notes. While many will find these helpful, students please note that some of them are not suitable for undergraduate level biblical studies. This is not a site-based tool, but a very flexible downloadable Bible studies package produced by Rick Myers. More than 25 million downloads across the globe indicates its enduring popularity. This is a valuable tool for those wanting to work off-line. It also offers a customisable system for creating your own notes. 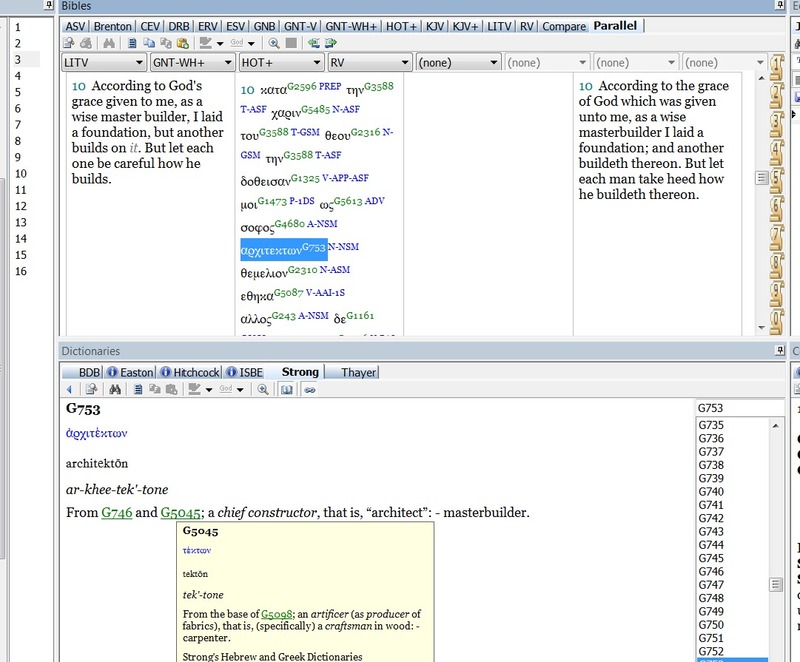 Once the main programme has been downloaded, a large range of Bibles, dictionaries, maps, and commentaries can be added. Many of these are completely free – however, they do tend to be fairly old. 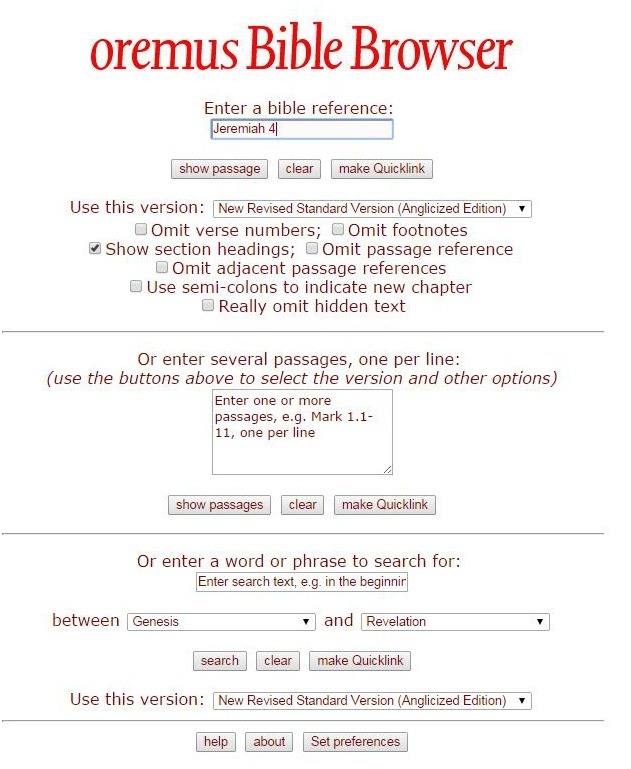 Bible versions (including NRSV) and more recent commentaries can be purchased. There is also the option of downloading your own reference library from a wide range of literature (including the Ante Nicene Fathers), many of which are also free. The option of creating your own library of tools means that e-Sword can be tailored to meet your requirements. The e-Sword website has produced some very helpful short tutorials that will help you to get the most out of this useful tool. They can be found here. Any serious study of the Synoptic Gospels (Matthew, Mark and Luke) is made much easier with a Gospel Synopsis – sometimes referred to as Gospel Parallels. First devised by Johann Jakob Griesbach in 1776, a synopsis sets out the shared Gospel material in columns. This creates an easy to use visual tool for reading the texts alongside one another. Unfortunately, although there are a number of online versions, most of them are still in development. 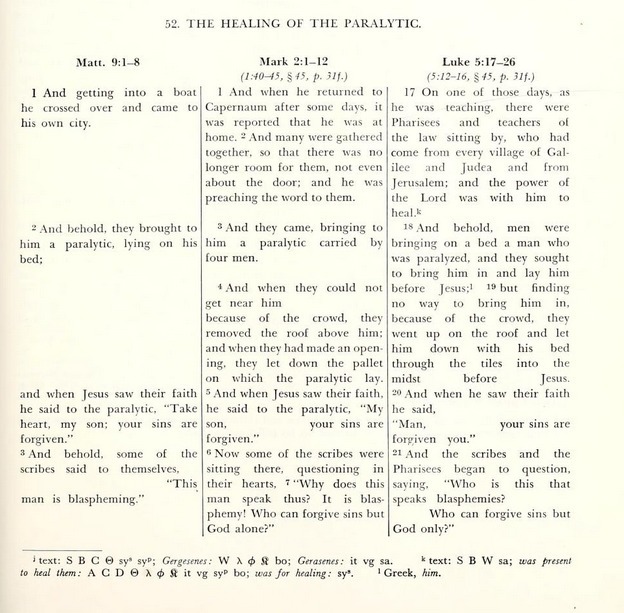 This link is to the Internet Archive‘s copy of Throckmorton’s 1957 Gospel Parallels. It is downloadable free of charge in multiple formats, including Kindle and PDF. It can also be read online. It is pretty old, but is certainly certainly still very useful. e-Sword is the oldest one i used before. 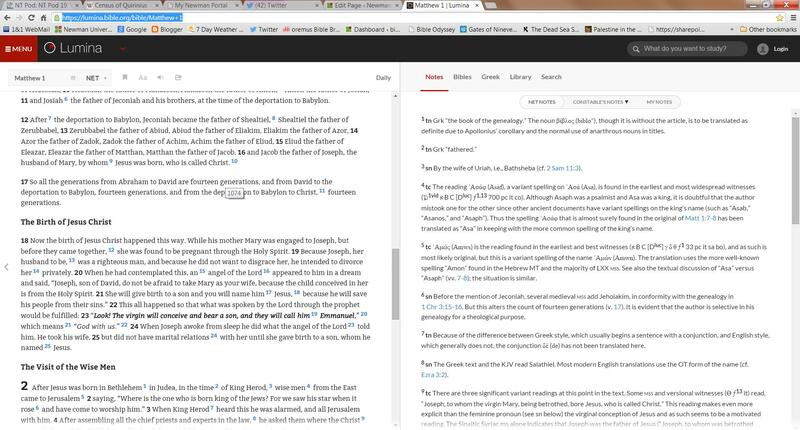 Now im tempted to use BlueLetter, seems so cool, together with my coolest MP4 Bible Study audio bible . It really depends what you you are looking for. 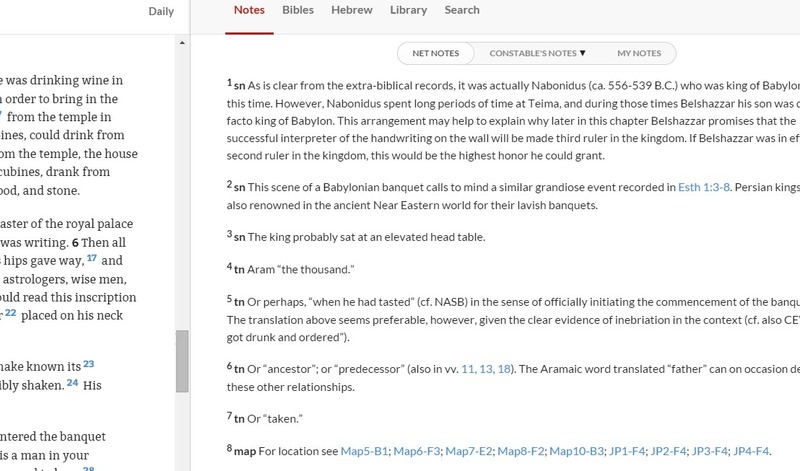 E-Sword has done stirling service as one of the oldest free online Bible tools (and the best thing about it is that you can use it offline), but compared to STEP and even Lumina it is pretty limited for any serious exegetical work on the texts. The BlueLetter Bible site is obviously very popular and offers a host of resources. For devotional studies, these are great, but I couldn’t recommend it to my students for degree level work. That shouldn’t be taken as a criticism of the site or the amount of work that has been put into it, it is just catering for a very different set of needs.